Caleb has also decided that this baby is a girl and her name will be Emily. Glad he's willing to make those big choices for us! We'll see how good his prediction skills are. 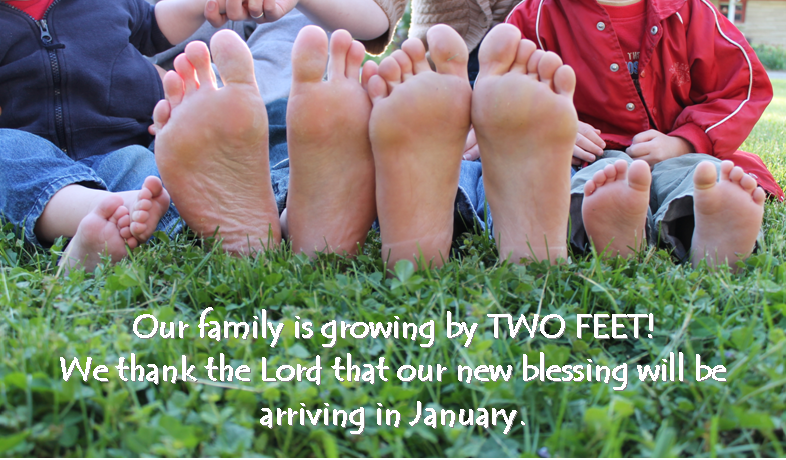 Regardless of gender, we're so excited! I can't believe I have the privilege of carrying another life and raising another soul. We thank God for that awesome privilege. My oldest son had one older sister and 4 younger sisters before he had a brother. He was 12, before he had a brother. He told me that he had prayed for a boy for the previous 4 babies and had only gotten sisters. So, he decided he would pray for a girl and maybe God would give him a brother. Well, he did get a brother, but I had to tell him I didn't think he "tricked" God with his reverse psychology prayer. He said later, that he knew that. But, God finally gave him a brother! I LOVE how you're announcing it! 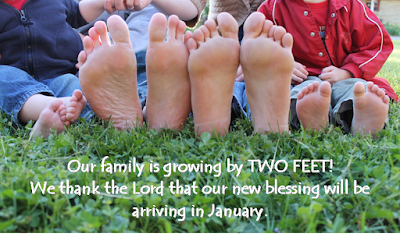 Well, I guess Caleb's making the formal announcement, but I love your pic =). SO excited for you guys!! !